Education Wanna Play a Game, Mama? Wanna Play a Game, Mama? “Wanna play a game, Mama?”. This is a question asked daily by my three-year-old. He loves games, particularly board games. I happen to love games too, so it is hard to resist his requests. 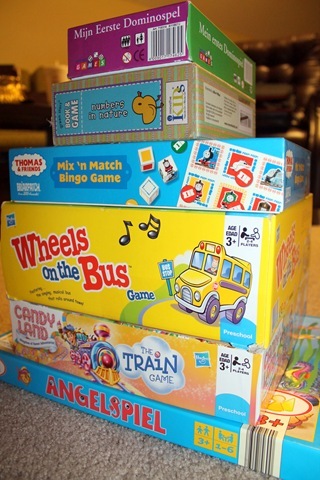 Some of my fondest memories from childhood revolve around playing board games with my family. Clue, Parcheesi, The Game of LIFE, Candy Land, Chutes and Ladders, and even a summer of insanely long games of Monopoly with my sister top the list. I still love to play games and my husband and I love nothing better than an evening of game playing with friends. Annual vacations with my college roommates always involve some game playing as well. The games have changed over the years, but some things never change. There is a sense of connection I feel when playing a game with someone. There are shared memories and always conversation and laughter. I play a lot of games with my three-year-old now and am often reminded of the numerous benefits of games. Socialization. Playing games requires communication. My son and I laugh, take turns, use manners, and SHARE. Language Development. We talk while we play games. Often there are opportunities to introduce new vocabulary and practice it during game play. Tonight, for example, we counted the number of matches each of us had at the end of a Memory game. We asked questions like “Who has the MOST matches?” and “Who has the FEWEST matches?”. Skill Development. We count, use one-to-one correspondence, identify letters and numbers, match pictures, demonstrate concepts of more and less and adding and taking away, etc. Patience and Persistence. When we started playing games, my son was about two and a half and his attention span was short. Now he easily waits for his turn and is determined to finish a game, no matter how many rolls of the dice it takes to do so. Imagination / Fantasy Play. My son loves selecting his playing piece in some of his games. He becomes the character behind the piece and sometimes assigns roles to the playing pieces. I can see his imagination developing more and more each time we play. 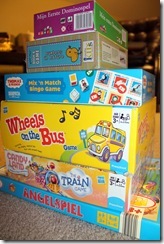 I am very impressed with the variety of games that are available for young children today. There are lots of rather pointless ones, but there are also some really good ones. We started with picture dominoes and moved to matching games like Memory. At two and a half, my son’s favorite song was “The Wheels on the Bus” and I actually found a board game called “The Wheels on the Bus”. It is really a fun game! It also has two levels of play to extend the life of the game as a child gets older. We are on the more advanced level now and he still loves to play it. We also get to sing the song and move a little musical bus around the board. Another multi-level game we enjoy is a train version of Candy Land. We also play a lot of Bingo! One of our Bingo games has three levels, focusing one just one attribute on the board or two or three attributes. We play on the middle level currently, but my son has started asking about adding in the third die, so I think we will try that soon. We already have great memories involving the games we play together as a family, and I am looking forward to dusting off my childhood favorites as my son gets older!